Login to add this video to your website You dont have video privileges. 1. DEAR DOCTOR VIDEOS. Dear Doctor, Inc. (“Dear Doctor”) produces certain educational videos on cosmetic dentistry (the “Videos”) for use by the members of the American Academy of Cosmetic Dentistry, Inc. (“AACD”) subject to the following terms and conditions. Dear Doctor also provides a video platform for viewing the Videos. Dear Doctor may add, delete, update or upgrade the Videos or platform at any time in its sole discretion. 2. LICENSE AND RESTRICTIONS. As a member in good-standing of the AACD, Dear Doctor grants to you a non-exclusive, non-transferable license to use the Videos, on your website or through a link, for yourself and the use of the visitors to your website and Dear Doctor will provide a website (the “Website”) where you can view and learn how to utilize the Video (the “License”). No other use or ownership rights are granted to you in the Videos. You agree that you shall not make or attempt to make any other use of Videos, including but not limited to copying, reverse engineering, disassembling, modifying, renting, leasing, distributing or creating derivative works from the Videos or transmitting it over a network. You shall not attempt to gain unauthorized access to any Dear Doctor systems or networks through hacking, password mining or any other means and will not tamper with, hinder the operation of or make unauthorized modifications to the Video, use another’s name, username or password or knowingly transmit any virus or other disabling feature to Dear Doctor. 3. DOWNTIME. You understand and agree that from time to time the Videos or Website may be inaccessible or inoperable for scheduled maintenance and upgrade installation or due to malfunctions and causes beyond the control of Dear Doctor because of act of God, accident, fire, labor dispute, riot or civil disorder, act of public enemy, enactment or act of any government or governmental instrumentality, failure of technical facilities, failure or delay of transportation facilities, or other cause not reasonably within its control (“Downtime”). You will not receive advance notice of Downtime and the occurrence of Downtime shall not be a breach hereunder. 4. PROTECTION OF PROPRIETARY RIGHTS. Dear Doctor shall solely own and have exclusive worldwide right, title and interest in and to the Videos and all upgrades, updates, and contributions and to any trademarks or trade names related thereto. Dear Doctor may include a copyright notifying users of the Videos, including your patients and prospective patients (“End Users”) that the Videos are protected by the copyright laws of the United States of America, and that if you or any End User is found by Dear Doctor to have acted in violation of the copyright laws or these Dear Doctor Terms and Conditions, then Dear Doctor has the right to take terminate your License hereunder and access to the Videos and Website. You shall not remove, obscure or modify the copyright and trademark notices on the Videos or Website. You agree to use your best efforts to protect the Videos from unauthorized use and you shall not at any time take any actions that would hinder, damage or in any manner dispute Dear Doctor’s ownership of the Videos. 5. LIMITED WARRANTY AND EXCLUSIVE REMEDY. The Videos and Website are provided “as is” without warranties of any kind, either express or implied, including but not limited to, the implied warranties of merchantability and fitness for a particular purpose. Dear Doctor does not warrant that the Videos or Website will meet your specific requirements or that the operation of the Videos, the Website or the links thereto will be error-free. Dear Doctor’s entire liability, and your exclusive remedy, shall be the replacement of any defective or non-working Videos or the links thereto or the termination of this License. 6. LIMITATION OF LIABILITY. Dear Doctor shall not be liable to you or any other third party for indirect, incidental, special or consequential damages arising out of or relating to the Videos or Website. In no event shall Dear Doctor be liable for any loss of your business, revenues or profits. 7. TERMINATION/SUSPENSION. Dear Doctor may immediately terminate this License and all other rights granted to you hereunder upon any breach by you of any of the Terms and Conditions contained herein. If Dear Doctor is notified by the AACD that your membership in the AACD has been terminated or suspended, this License and access to the Videos and Website shall automatically be terminated or suspended. Dear Doctor shall have the right to rely solely upon the information provided to it by the AACD as to any individual’s membership status and Dear Doctor shall have no obligation to make any independent inquiry into any individual’s membership status. If you have a question or dispute as to your membership status with the AACD, you must inquire and resolve such dispute solely with the AACD. All membership inquiries must be handled directly by the AACD and Dear Doctor will not reinstate any individual’s License or access hereunder without authorization and instruction from the AACD. Upon termination or expiration of the agreement between the AACD and Dear Doctor, which provides these Videos and Website to you as a membership benefit, this License to you shall automatically terminate. 8. MODIFICATIONS. Dear Doctor and the AACD reserve the right, from time to time to make modifications to these Terms and Conditions, in its sole discretion, without prior notice to you. Continued use of the Videos or Website, following any modification to these Terms and Conditions, will indicate your acceptance to the modification. A link to the current Terms and Conditions may be found at http://www.aacdvideos.com/terms-and-conditions/. Copy & paste the embed code above to use on your web site or click the icon below to share this video on Facebook. 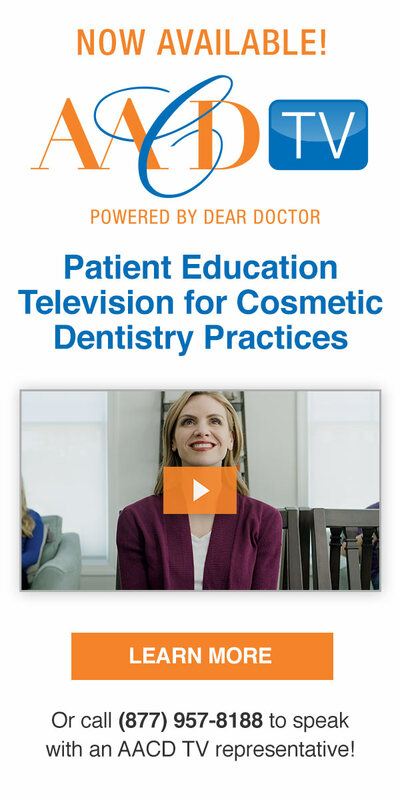 AACDvideos.com is available through the American Academy of Cosmetic Dentistry’s patient education partnership with Dear Doctor. Dental videos for your dental practice website. View AACD endorsed Cosmetic Dentistry Articles. Copyright © 2015 Dear Doctor, Inc. All Rights Reserved. If you are accessing this site for a client, please call (866) 821-5458 for help! Is this your first time visiting AACDvideos.com and don’t know your password? Enter your email address used to access your myaacd account and we will email your password to you.